What is the difference between "One-time Donation" and "Monthly Donation"? How do I set up a recurring monthly donation? How do I change the way I pay for a monthly donation subscription? Error Message: “You already have an account with this information" or "You have already signed up with this information"
Error Message: "You cannot use an e-mail address or card number that belongs to an existing PayPal account. If you have a PayPal account, please log in. If you don't, please change the e-mail address or card number and try again." All transactions go through PayPal's SSL-secured System. We do not keep any credit card information on our system. If you have any PayPal-related questions, please check the PayPal site for their FAQs. How do I view my password? A one-time donation is a single donation. Select this option to make a one-time donation. A monthly donation is a recurring donation. For instance, if you would like to make a monthly donation of $100, select this option. You will automatically be billed each month (through PayPal) in the amount you choose from the options. You can cancel at any time. Select the donation amount from the options. Click (You will be taken to PayPal). You may have to log in to your PayPal account. Confirm that you want to cancel the monthly donations by clicking on Cancel Profile to confirm your request. Once confirmed, you will receive the message: "This profile has been canceled and cannot be reactivated. No more recurring payments will be made." Check your email. 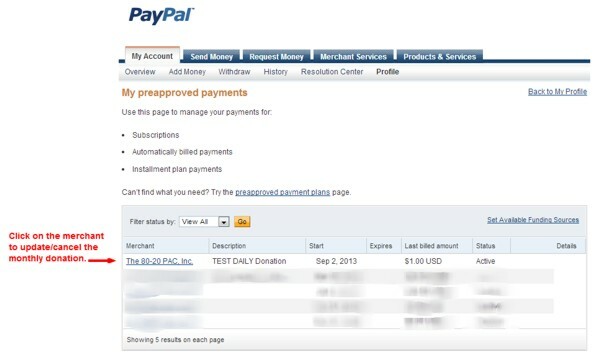 You will get a confirmation email from Paypal once your monthly donation subscription is confirmed. 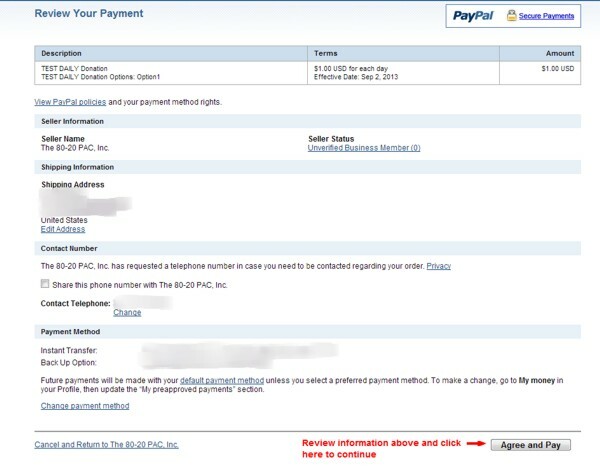 If you do not receive the confirmation email, make sure that you've confirmed the canceled payment (see steps 3-4). Log in to your PayPal account and go to "Profile", then select "My Money" to manage your monthly donations. Click on the merchant to update/cancel the donation. 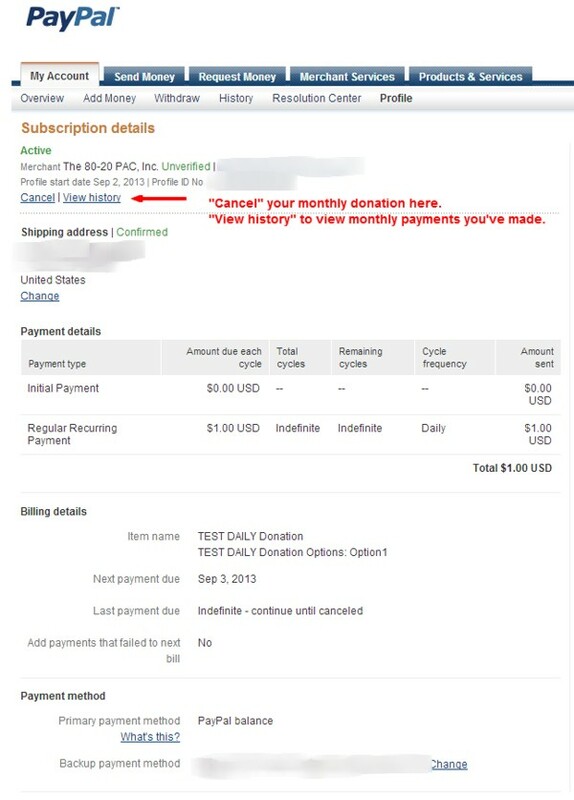 Check your email - you will get an email confirmation from PayPal once you cancel the monthly donation subscription. If you do not receive the confirmation email - make sure that you've confirmed the payment cancellation (see steps 3-4 above). “You already have an account with this information” or "You have already signed up with this information." If you forgot your password, you have to create a new password. It’s easy to do. Use the steps below to create a new password. Click forgot? in the Password box. Enter the email address you registered with PayPal. Enter the characters shown in the image in the security text box, and click Continue. Enter information to confirm that you own the account, and click Continue. Enter your new password twice, and click Submit. Click forgot? in the Email address box. Click I don’t know what email address I used. Enter up to 3 email address you may have used to create your PayPal account. Select the option to I want to create a new password or select I know my password and want to log in. Follow the prompts to complete updating your email address. 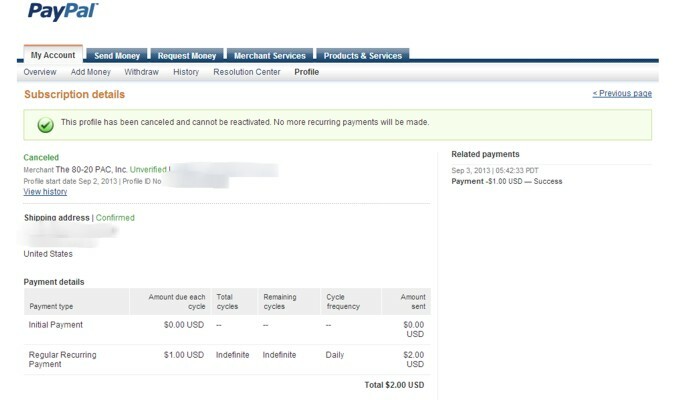 The first time you pay through PayPal, PayPal automatically creates an account in their system against your credit card number and email address. Later, if you ever try to use PayPal again and enter either the same credit card number or email address, PayPal recognizes that you have an “account” with them and requires you to login (you cannot check-out as a “guest” with the same email address or credit card). Since you inevitably won't know your PayPal password, you'll need to follow the process to login, then click the link to recover your password, which will be sent to your email address. You can then use it to login and complete your payment by credit card through PayPal. 80-20 does NOT keep any information about your credit cards or PayPal account details, but relies on PayPal to manage all that, with PayPal simply sending confirmations back to 80-20 that the payment has gone through (or not). So, if you are having challenges on the PayPal site while trying to get a payment through, we unfortunately cannot help as we have no control over your PayPal account. 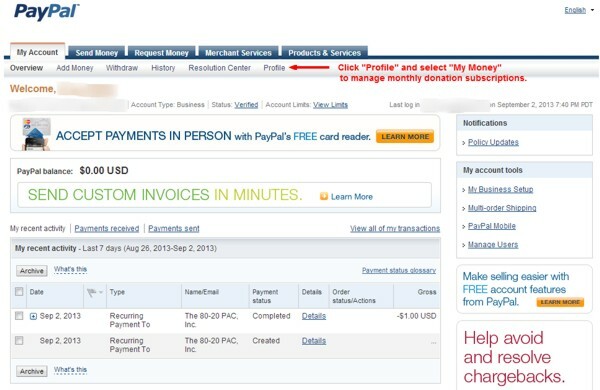 You can find solutions on the PayPal site by clicking here. 80-20 does not have the ability to facilitate that interaction in any way. PayPal has certain policies that require you to use their service in a certain way as a purchaser, including ensuring consistent use of e-mails and credit card numbers, as these are fraud prevention measures. You forgot your password or email address. You changed your email address or password. If you forgot your password or changed your email address, click forgot? and follow the instructions. You may also need to clear your cache and cookies. For instructions on how to do that, please visit PayPal by clicking here. All transactions go through PayPal's SSL-secured System. 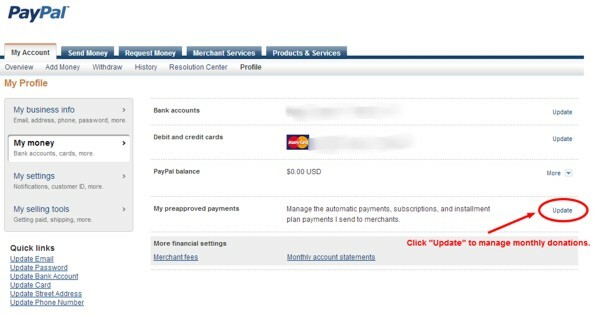 We do not keep any credit card information or details about your PayPal account on our system. 80-20 keeps no information about your credit cards or PayPal specifics, but relies on PayPal to manage all that, with PayPal simply sending confirmations back to 80-20 that the payment has gone through (or not). So, if you are having challenges on the PayPal site while trying to get a payment through, we unfortunately cannot help as we have no control over your PayPal account. You can find solutions on the PayPal site by clicking here. 80-20 does not have the ability to facilitate that interaction in any way. PayPal has certain policies that require you to use their service in a certain way as a purchaser, including ensuring consistent use of e-mails and credit card numbers, as these are fraud prevention measures. If you have any PayPal-related questions, click here to go to the PayPal site for their FAQs.